Tags: Antique Print, Asia, Ternate. 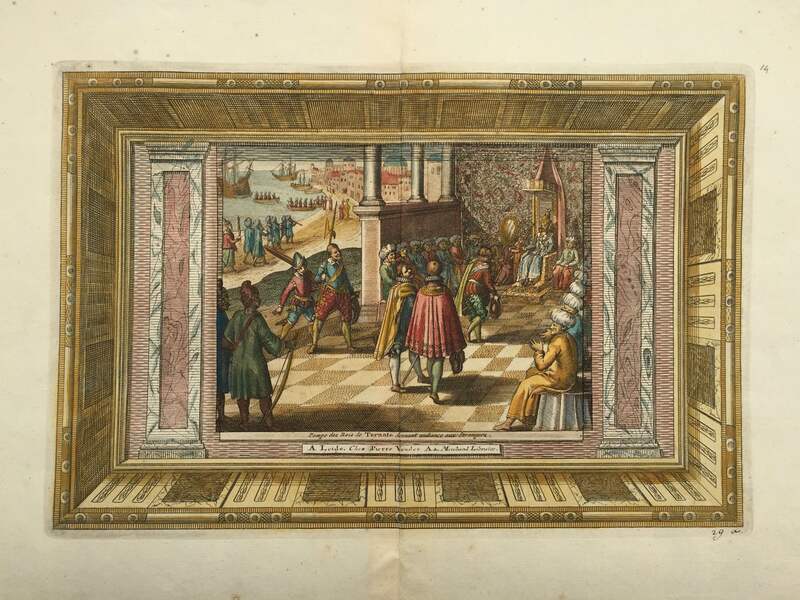 Antique print Francis Drake titled ‘Pompe des Rois de Ternate dannant audience aux Etrangers. A. Leide, Chez Pierre Vander Aa, Marehand Libraire’. A fine early 18th century French print in old colour by Pieter Vander Aa (1659-1733) showing officers from Francis Drake’s ship the Golden Hind being received by the Sultan of Ternate in his palace in 1579 during Drake’s circumnavigation of the globe (1578-1580). The plate was published in Vander Aa’s La Galerie Agreable Du Monde Tome premier des Indes Orientales in 1729, a mammoth work comprising 66 parts and bound in 27 volumes was the biggest print / map book ever published. Van der Aa incorporated plates by other publishers such as Blaeu, Visscher, de Wit, meurs, Halma, Mortier, Allard in this work and often added broad decorative borders. Probably the costliest and complete universal geographic work ever produced. It is said that only 100 copies were printed (Ref: Koeman Aa9). Sir Francis Drake, vice admiral (c.1540 – 27 January 1596) was an English sea captain, privateer, navigator, slaver, and politician of the Elizabethan era. Drake carried out the second circumnavigation of the world in a single expedition, from 1577 to 1580, and was the first to complete it as captain and leader of the expedition throughout the entire circumnavigation. Elizabeth I of England awarded Drake a knighthood in 1581. He was second-in-command of the English fleet against the Spanish Armada in 1588. He died of dysentery in January 1596 after unsuccessfully attacking San Juan, Puerto Rico.